Less than half – 2.3 million – of the nation’s unauthorized immigrants who potentially qualify for deportation relief and work permits under President Barack Obama’s executive actions live in the 26 states that have joined a lawsuit to stop the move, according to a new Pew Research Center analysis. The president’s programs are open to an estimated 5 million unauthorized immigrants who were either brought illegally to the country as children or who are parents with a child who is a U.S. citizen or legal permanent resident, so long as they meet certain requirements. A group of states led by Texas filed a lawsuit in December to stop the actions, arguing that the president didn’t have the authority to make the changes. A federal judge heard arguments in January. A ruling could come before Feb. 18, the day the U.S. Department of Homeland Security starts accepting applications from those who arrived in the U.S. as children and have become newly eligible (some have already received relief based on a 2012 program). Among the states that have joined the lawsuit, most of the unauthorized immigrants who potentially qualify for relief under the new executive actions are concentrated in just a handful of states. For example, half live in Texas (825,000) and Florida (300,000). 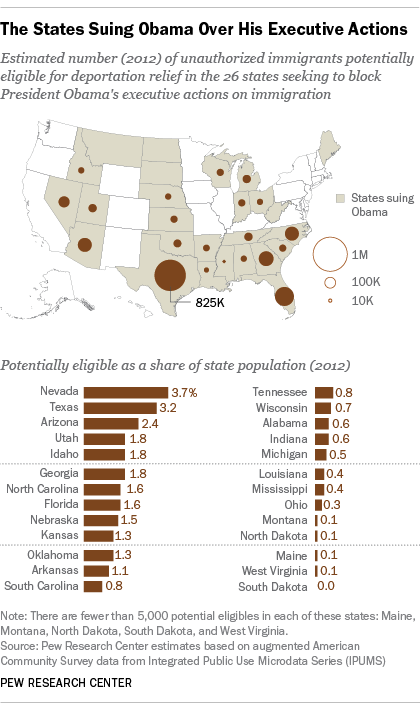 Four more states (Arizona, Georgia, Nevada and North Carolina) each have 100,000 or more of these immigrants. Overall, unauthorized immigrants potentially eligible for deportation relief make up about 1.6% of the total U.S. population and 1.5% of the combined population in the 26 states that jointly filed suit. Nevada and Texas, both of which have joined the lawsuit, have the greatest statewide concentrations of unauthorized immigrants who could qualify for the programs (3.7% and 3.2%, respectively). Besides these states, four others exceed the national rate: Arizona (2.4%), Utah (1.8%), Idaho (1.8%) and Georgia (1.8%). In the remaining 20 states, the shares of their populations that may be eligible are at or below the national average, including 14 states with shares that are less than 1% of their population. Some 54% of the unauthorized immigrants who may qualify for relief live in the 24 states that have not joined the lawsuit, as well as the District of Columbia. This is in large part due to California, which alone is home to about 1.2 million of the potentially qualified unauthorized immigrants – about a quarter of the total (24%). Twelve of these abstaining states, plus the District of Columbia, have filed a legal brief in support of the president’s executive actions. These 12 states and the district are home to 42% of the unauthorized immigrants who could qualify for the programs.